Considering the wild swings in US weather, our end-March carryout stands near 1.1 tcf (31.1 bcm), which translates to a 2.80 $/mmbtu injection season 2019 (April–October) strip. Balances still look loose on a y/y basis, with production stepping up by 7.4 bcf/d (0.21 bcm/d) y/y to 90.4 bcf/d (2.6 bcm/d). 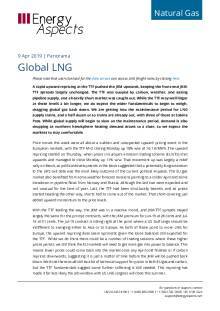 LNG exports are set to surge by 2.1 Mt y/y to 7.3 Mt in Q1 19 as Sabine Pass T5 ramps up and gain a hefty 5 Mt y/y in Q2 19-Q3 19 to 15.5 Mt. Considerable timing risk still exists, particularly around the start-up of Cameron LNG T1 and Elba Island T1, which would provide downside to our numbers. We anticipate most additional cargoes will find a home in Europe as greater LNG supply is already encouraging coal-to-gas switching in the region. 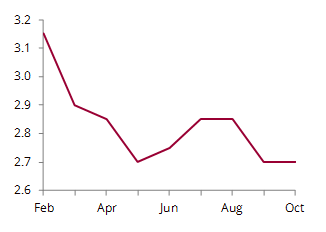 Warm weather in late December 2018 and early January led us to project an end-March carryout of 1.55 tcf (43.9 bcm) in early January, which shifted our view of the 2019 injection season to very bearish. However, a cold blast in late January and early February has shaved that figure significantly, with the largest withdrawal of this heating season so far recorded in the week ending 1 February, at 237 bcf (6.7 bcm). Balances are now suggesting an end-March carryout near 1.1 tcf (31.1 bcm). While such a level might not sway non-physical market participants to stoke concerns around scarcity, notices of strained operating conditions and ‘storage-critical’ days underscore how well-managed stocks in some areas need to be. Such an end-March carryout would encourage summer 2019 prices to trade closer to 2.80 $/mmbtu to discourage power sector gas demand and instead permit stronger injections into storage. Besides the massive US demand swings in the past few weeks due to weather extremes, the market has started to focus on the extent of production growth this year. Output in 2018 was higher y/y by an incredible 8.5 bcf/d (0.24 bcm/d). Although this year we anticipate a decline in incremental growth to 7.3 bcf/d (0.21 bcm/d), we are still looking at loose summer season balances on a y/y basis, even with a massive upswing in structural demand. We expect that power demand will be flat to moderately higher y/y at 32.4 bcf/d (0.9 bcm/d) over the injection season given the above-normal cooling loads last summer. Some early producer guidance is indicating decreased Capex for 2019. Service companies are pointing to lower completion activity, and frac spreads fell over the course of Q4 18. Market sentiment is less positive on the extent of production growth this year amid lower activity indicators and a m/m fall in US gas output in January, though that output had been plagued by operational issues and freeze-offs. However, we think that production growth could prove to be stickier than activity indicators suggest. From our Q3 18 survey of the largest US gas producers, 54% of output was indicated as hedged at an average of 3.10 $/mmbtu. In November 2018, when the curve shifted higher, the Swap Data Repository indicated some producers put on more hedges, locking in prices near 3.25 $/mmbtu. Our view is that US oil production growth will come in at 1.35 mb/d in 2019, although growth is weighted to H2 19. For the Permian, we also peg gas production growth as weighted to H2 19 given the expected October 2019 start-up of the 2.0 bcf/d (57 mcm/d) Gulf Coast Xpress, which will add much-needed takeaway capacity. For the Northeast, 2019 infrastructure additions are set to be much lower than the 6.3 bcf/d (0.18 bcm/d) in 2018, especially given the risks around the Atlantic Coast pipeline. We also anticipate that new takeaway capacity will not be filled completely, but it will drive some incremental growth. Market sentiment has ridden a rollercoaster along with the weather forecasts in recent weeks. Late January and early February cold has shifted the projected end-of-season carryout toward 1.1 tcf (31.1 bcm)—nearly 0.5 tcf (14.2 bcm) higher than the carryout after the polar vortex winter and the second-lowest seasonal carryout in the past five years. We have trimmed our power burn forecast, as the return of cold reduces the need to burn off excess inventory next summer compared to our outlook a month ago. For the injection season, we forecast power sector gas demand growth at a modest 0.2 bcf/d (5.7 mcm/d) y/y. Mexican pipeline infrastructure has been subject to prolonged delays, but for Sur de Texas-Tuxpan and Valley Crossing, progress seems to be advancing. On 30 January, Valley Crossing notified FERC that final works and checks had ended at its underwater connection to the 2.6 bcf/d (74 mcm/d) Sur de Texas-Tuxpan and requested that the commission authorise the start of pipeline operations. Commissioning activities are expected for mid-February. We see US pipeline exports to Mexico growing by 0.7 bcf/d (19.8 mcm/d) y/y to 5.4 bcf/d (0.15 bcm/d) over the injection season, with Mexican downstream constraints still a potential limiting factor. We believe injection season Mexican LNG takes will step down by 0.2 bcf/d (5.7 mcm/d) to 0.5 bcf/d (14.2 mcm/d) on expectations of additional pipeline supply through Sur de Texas-Tuxpan, some potential flows on the Wahalajara system (set to start-up in May, although the risk of further delays remains high) and the reversal of flows on TransCanada’s Manzanillo-Guadalajara pipeline. 2019 promises to be a banner year for US LNG exports. For the summer, feedgas flows for LNG exports are the single largest growth item in our demand-side balances, although timing risk remains. The first trains at Elba Island and Cameron LNG are likely to miss their stated Q1 19 in-service dates, especially given Cameron LNG has yet to request feedgas initiation from FERC. Our reference case accounts for this slippage, but we still forecast an incredibly strong 2.6 bcf/d (73.6 mcm/d) y/y increase in the summer. We forecast Henry Hub to trade around 2.80 $/mmbtu this summer and spreads to remain open to Europe’s TTF. 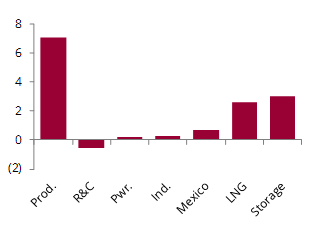 US LNG exports should expand by 5 Mt y/y to 15.5 Mt, with most of that additional demand heading into European ports.